Today we have the pleasure of a lovely guest blog post. Enjoy! It is essential to choose furniture built with clean, straight lines; heavier patterns tend to be trendier and fall out of style quickly, whereas simplicity is timeless. Modern designs incorporate sleek materials like hard plastics, glass, metal, or recycled products. It balances open space with functionality, creating visual interest with understated pieces. Depending on the size of the room, a couch usually offers the best choice for formal seating. It needs to be functional without any ornamental features, but definitely comfortable enough for residents and guests to sit on as well. When possible, try to open up space with the furniture positioning; try facing the couch towards a window, a fireplace, or – best of all – opposite other seating. Placing too much furniture in a small space will detract from the cleanliness of modern design; the room should not appear too full or overdone. Keep it simple and avoid any bulky furnishings. Consider looking for European designer couches, because these almost always possess modernist designs. A coffee table is essential in a modern living room. A functional coffee table serves multiple purposes. It’s a hot spot for friends to gather for cocktails or games on a weekend, as well as an office area for working on at home. Like the other furniture, the coffee table should combine clean lines with a low, streamlined look. From a two-tiered designer glass table to hard plastic storage bins topped with a heavy piece of tempered glass, a functional coffee table can reflect your personal sense of style. A rug is often one of the only accessories to use a soft texture or a patterned design in a modern living room setting. Hints of the rug’s pattern or color often reappear in artwork or another artistic accessory to give the room a cohesive look. This serves an important purpose, as the placement and color of the perfect rug can pull the key elements together. The rug is often positioned in front of the couch or under the coffee table. The size of an area rug is important; it needs to be large enough to place under the front edge of the couch and extend just beyond the chairs on the other side of the coffee table. If space allows, place two small chairs directly across from the couch for the purpose of additional seating. Coordinate or contrast the solid color of the couch with the chairs, or – if you’re feeling ambitious – opt to use an abstract or geometric pattern. Look for straight clean lines for these extra pieces, as minimalistic chairs are an unmistakable element of modern interior design. Extra seating can also reflect your personal taste and creativity; if you have carpentry or furnishing skills, try to repurpose another item – like a small stool – to serve as a seat. You can use your imagination to think of items to use for making extra seats, just remember to keep it functional and streamlined. Just the right amount of accessories is essential in modern design. 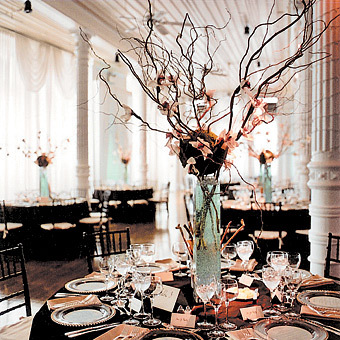 Use accessories sparingly to accent colors and designs in the room. Artwork on walls should be large, but still small enough that they refrain from “taking over” the room. Choose an abstract piece reflecting a hint of color or pattern found in the area rug. Avoid filling up the wall; one large piece on either side of a window is all you need to add visual appeal. A few solid pillows can also splash color in the room as long as you are careful to keep the look simple. Focusing on these five essential elements can help you create the modern living room of your dreams. Just clear out the room, paint the walls a solid color and start designing! You can find all kinds of great design sites on line. Browse through some modern furniture sites and check out couches and chairs to get an idea for your own modern living room. HGTV announces “Design Wars” to premiere November 21st!! Tune in to see Shirry on “Design Wars” this November on HGTV!!! We are excited to announce that she will be competing in 2 episodes!! We’ll keep you posted on the actual air dates. Also check out “Selling LA” on HGTV November 3rd. The show will be featuring our fantastic Malibu design project…and you may catch a glimpse of Shirry touring the house with realtor Aaron Kirman! Creating a Festively Fall Atmosphere!! Today we are going to talk about all the fun little changes that will get your home into the fall season. There are several changes you can make during this time of year that will transform your home into a cozy retreat without breaking the bank! Below are several suggestions to help creative a fall atmosphere as well as the trending styles for this season. Let’s start with the 2011 colors for fall. Right now plum, mustard brown, rusty orange and burnt red are all the rage!! These are great accent colors that can easily be incorporated into any home. First, I would suggest replacing items such as pillows, area rugs and throw blankets since they pack such a large punch. 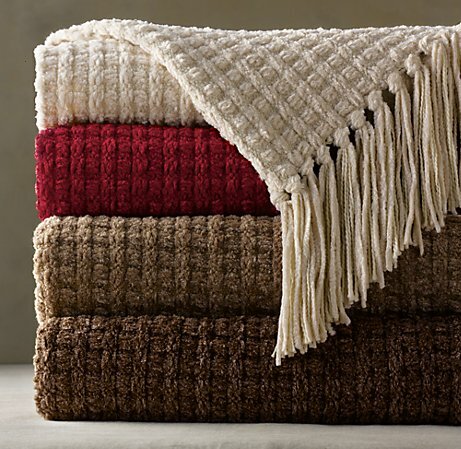 Using these colors gives your home and/or room a warm fall look. Below are several examples of area rugs and where to get to find these items. 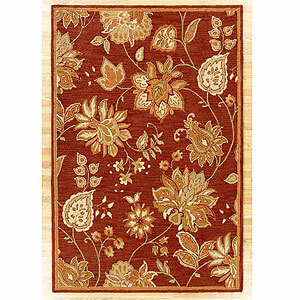 The Tufted Spiced Palampore Rug can be found at World Market. This rug will bring your dining room or living room to life. The spiced color is perfect for the season! Quilted Pillows below can be found at West Elm. 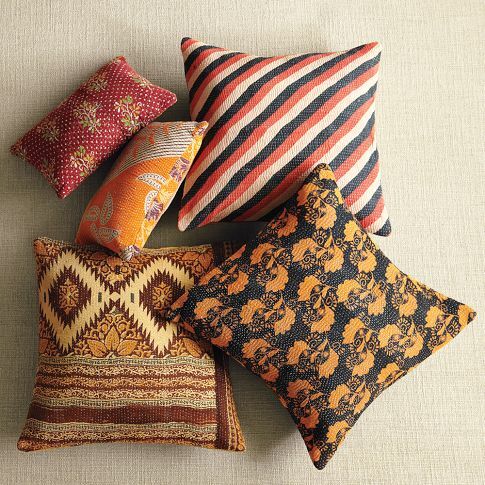 Take a few colors from these pillows and get complementing solids to mix and match! Pottery Barn is one of the best places to resource for fall decorating. 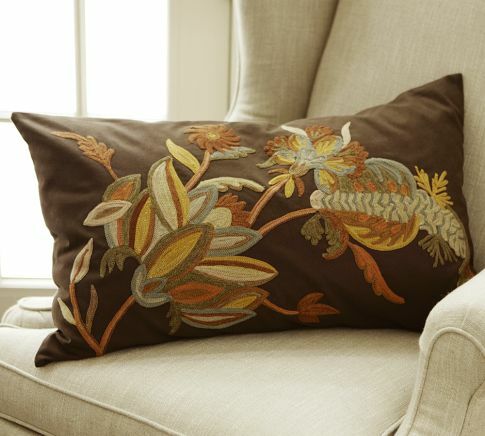 Below is just one of many embroidered and perfectly fall colored pillows. 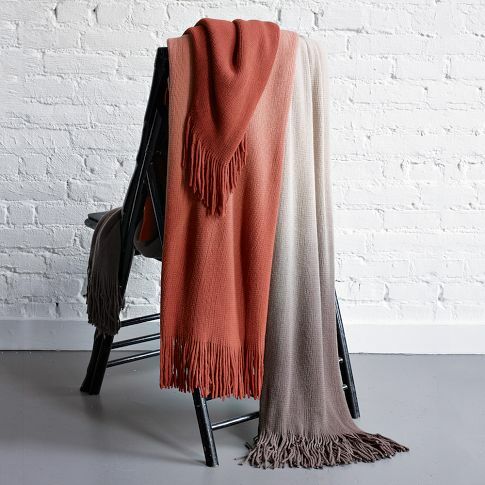 These fantastic dip dye throws can be found at West Elm. They come in a variety of warm color and fit in a traditional or contemporary space. Another way to bring some fall charm into your home is to paint or wallpaper an accent wall. Is so simple you can even do it over the weekend! This will make a huge difference, and it can be easily changed throughout the year, especially if it is just one or two walls! Lastly, you can add the little details to your home such as dining and coffee table settings, candles, and floral arrangements. You can even change the accessories on your coffee table like adding some fun fall inspired books or magazines.